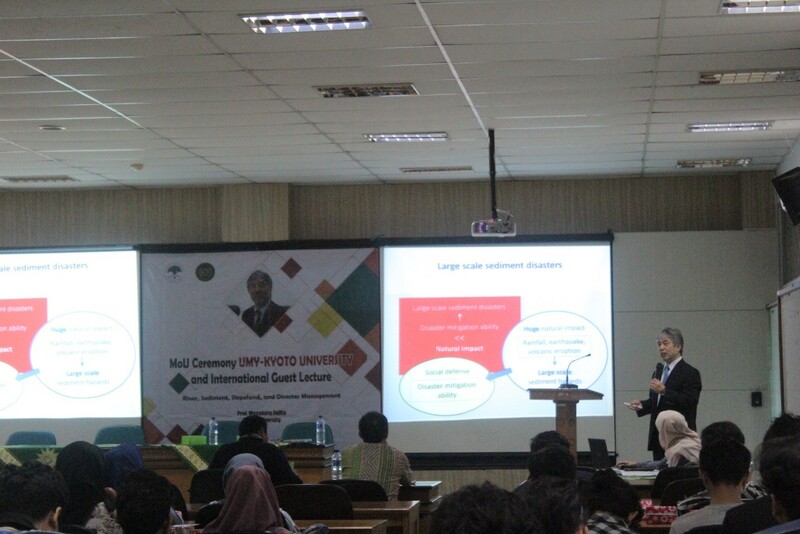 Civil Engineering Department, Faculty of Engineering University of Universitas Muhammadiyah Yogyakarta (UMY) held International Guest Lecture with Kyoto University on Thursday, November 30th, 2017. International Guest Lecture was held at Stadium General room, Building F1 in the 2nd floors of Faculty of Engineering UMY. 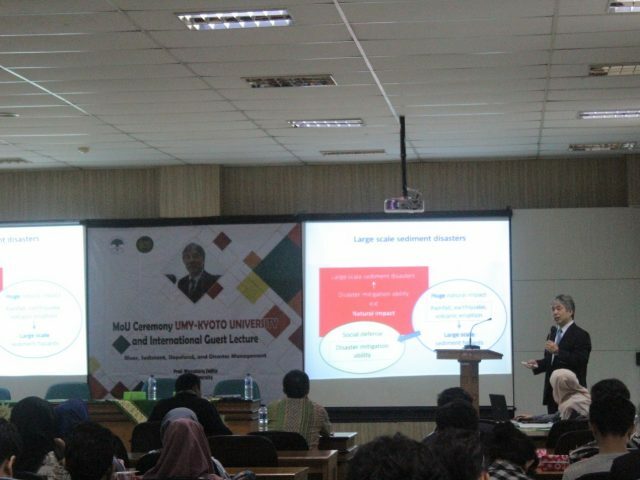 The event started after the signing of the Momerandum of Understanding (MoU) between Faculty of Engineering UMY and Faculty of Engineering Kyoto University. International Guest Lecture attracts students of Faculty of Engineering UMY especially students of Civil Engineering Program. The theme of agenda is “River, Sediment, Slopeland, and Disaster Management”, the high enthusiasm of the students can be seen from the number of students who attend, there are 119 students who attended the International Guest Lecture at this time. The students who attended also came from various forces, both generation 2015 until freshmen class of 2017 also attend and learn together about how Japan to tackling natural disasters in the country. The International Guest Lecture event took place quite interesting, Professor Masaharu Fujita as the giver of material also gave an examples of natural disasters that occurred in Japan, how the process of disaster and how to overcome the disaster. Professor Masaharu Fujita also pointed out that the great natural impacts in Japan are caused by massive rainfall, earthquakes and volcanic eruptions. Professor Masaharu also said that the TALAS Hurricane that occurred in the Kii Peninsula one of the islands in Japan especially in Kazeya region in 2011 caused heavy rain and highly rainfall, resulting in more than 60 landslides, landslide dam, large debris falling and there was a very high flood in the area. Professor Masaharu also said that in Japan there is a warning system for sediment disaster, which can predict disaster based on rainfall monitoring data. Disaster information or warnings contained in Japan can certainly help people evacuate faster and better. After the submission of materials by Professor Masaharu Fujita, question and answer session between students and Professor Masaharu Fujita was done, some students asked questions about how the disaster warning system that occurred in Japan and at the end of the event there is also a souvenir from Faculty of Engineering UMY to Kyoto University.